Drawer storage systems have revolutionized the way work vehicles are used. As more and more items continue to find their way into the back of your SUV and pile up, it becomes more difficult to locate the one you or your staff need. It also increases the difficulty of securing all of those things safely in place. With a proper SUV drawer system from D&R, these issues are easily solved. An SUV drawer system is the best way to securely store and organize your cargo and working equipment. SUV drawer system can be made using different materials ranging from plastics to metal. Some drawer systems are weather-proof, particularly for the decked type, but most are just weather resistant. Specific drawers are available for industrial, commercial and construction grade tools, the kind of material that is highly durable, scratch resistant and protective. With D&R, our SUV drawer system is made to withstand inclement weather but not all types are fully sealed. Some of them can keep dust and water from entering the storage space and covering your goods. Others do much better in sealing out the elements completely. With professional expertise, we can help you select the type that can do both to best to protect your items. Any SUV drawer system can be sufficient to store most cargo, but equally important is to secure the drawer system in place. With a professional installation, we will ensure that your chosen storage system is secured in your specific applications by ensuring the mounting points in your vehicle, assuring they are stable enough to carry all your items onboard. 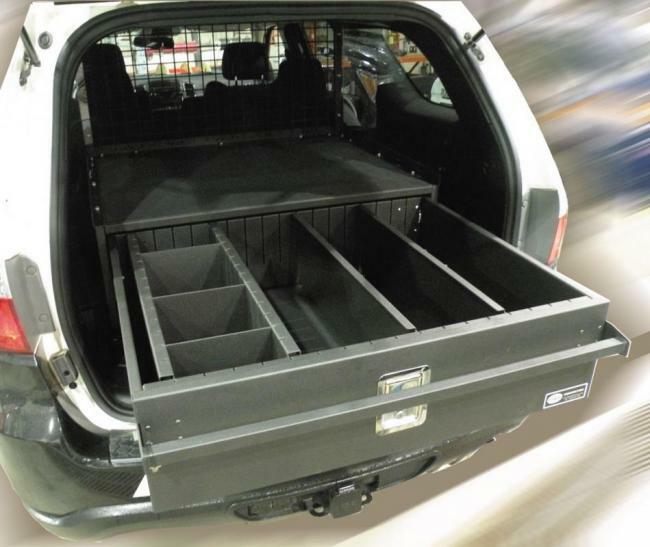 Rely on D&R Electronics to build your custom made SUV drawer system to perfectly suit your vehicle size and project. All of our custom solution products are made with high quality materials for durability and strength, relying on reputable parts and manufacturers. Contact us today to speak with an expert or to request a consultation.